The honour was announced at the International Gaming Technology and Clubs Queensland Awards for Excellence at the Brisbane Convention Centre last night in front of about 1000 guests. 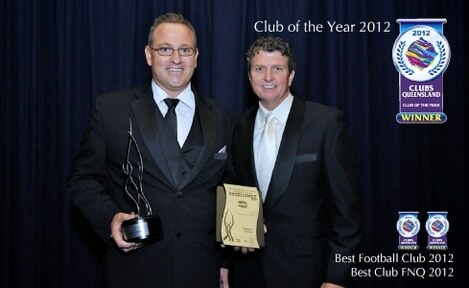 The top prize completed a hat-trick of awards for Cazalys on the night, after wins in the Best Football Club and Best Club Far North Queensland for 2012 categories. “Achieving the Club of the Year award, and Best Club Far North Queensland for the second year running is an outstanding achievement for the club, its board and staff,” Clubs Queensland president Don Seccombe said of Cazalys success. Mr Seccombe praised the club’s “particular commitment to the development of youth initiatives, community giving and sporting facilities in the Cairns region”, along with a strong membership base of more than 23,000. Cazalys’ decision to donate $50,000 a year in community grants through the Cazalys Community Fund was also recognised by Mr Seccombe, noting the extensive contribution to the region. “They truly serve as a role model for all Queensland community clubs,” he said. The club is also home to the Manunda Hawks AFL team, while the associated stadium has hosted international cricket and top-tier AFL matches. Richmond Tigers and Gold Coast Suns will this year play the second of three scheduled annual premiership games. Cazalys Stadium had upgrades to its lighting facilities last December, in the hope of attracting more sporting matches to Cairns, such as a World Cup cricket fixture in 2015. Last night’s achievement by Cazalys is not the first time the local club has been in the awards spotlight, after taking out the Best Club Far North Queensland and Best Community Service by a Club awards in 2011.